This is the birth record of Szlama Wigdor Brajtburg (Victor Breitburg), May 7, 1927, obtained in 1997 from the Urzad Stanu Cywilnego (U.S.C. - civil registration office) in Kamiensk. Click the documents below to view a full sized image. Click your browser's back button to return to this page. There is currently no JRI-Poland Shtetl CO-OP Initiative for Kamiensk. To volunteer for this project, contact Hadassah Lipsius. 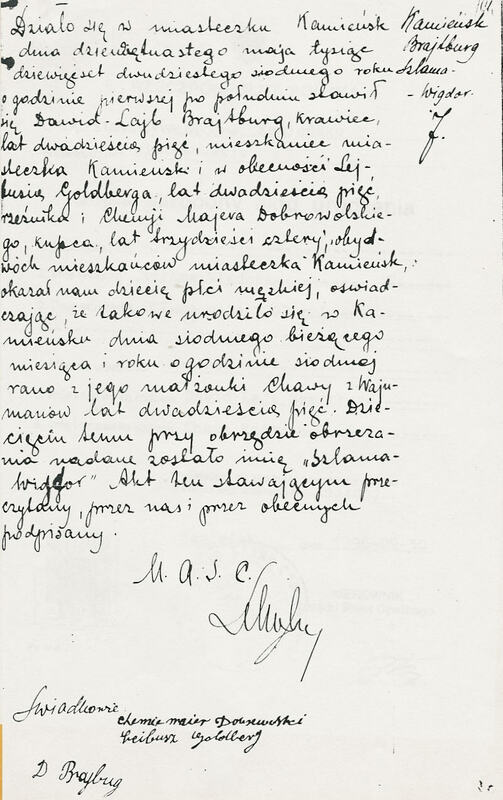 No indices to Kamiensk Jewish vital records are currently in the JRI-Poland database. The JRI-Poland Polish State Archives (PSA) Project is an ongoing project to obtain indices to late nineteenth-century Jewish vital records not microfilmed by the LDS. For further information on this project, contact Piotrkow Archives Coordinator Gloria Berkenstat Freund.